December 2, 2009 December 2, 2009 Warners' Stellian ApplianceLeave a Comment on What is convection? 1. Ignorance of a smart cooking method; leads to sluggish cook times, uneven results, under-utilization of oven capacity, culinary malaise. Still today, many suffer from convection indetection. It’s a tragedy. People own convection ovens without even realizing it. Or worse, they simply don’t understand how to use convection. But now that it’s holiday cookie baking season, you need to know you can bake three trays of cookies without rotating them. Convection cures hard-on-the-outside, raw-on-the-inside syndrome. 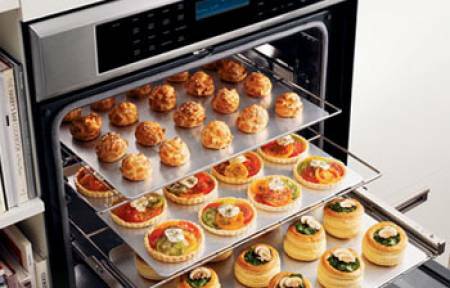 Convection, used for years in commercial bakeries and kitchens, allows faster and more even baking by incorporating airflow into the oven. Sometimes convection is just a fan. True convection, sometimes called European convection, includes an electric element behind the fan, which allows for more even heat distribution to each rack. The even heat distribution means no shuffling or turning trays when baking multiple items at once. As the air passes over it, the element also burns off odor and flavor before it flows back through the oven cavity. Not so important when baking three trays of gingersnaps, but so crucial when cooking distinct multiple dishes simultaneously. A rule of thumb: ALWAYS reduce cooking temperature by 25 degrees when using convection. And practice. Don’t debut your convection baking for dinner with the in-laws or worse, the holiday. We’ve gotten plenty disappointed calls following burnt turkeys resulting from Thanksgiving convection experiments. Convection can reduce cooking time for foods usually baking for longer than 20 minutes. For food that’s usually done in less than 20 minutes, it won’t be done faster, but it will cook more evenly. To be safe, check for doneness a bit before the minimum cooking time, but try to use the oven light instead of opening the oven door to minimize temperature fluctuations. NEVER use convection on delicate items like souffles and cheesecakes. ALWAYS invite me over for a taste. Learn recipes specifically designed for convection ovens. MyRecipes.com, which features recipes from personal favorites Cooking Light, Southern Living and Real Simple — among others — has a slew of convection oven recipes online for free. Next Will you help us feed the hungry?